Capture long exposures & time-lapse photo sequences remotely and wirelessly, thanks to the hahnel Captur Timer Kit for Fujifilm digital SLR cameras. 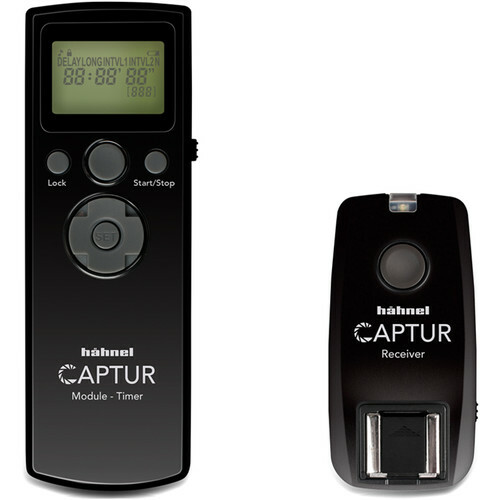 This bundle enhances your Captur remote shutter release system by providing a AA battery-powered interval timer module, as well as a receiver for mounting on a camera. Additional receivers are available for firing even more DSLRs. Use this kit with the transmitter you already have, or purchase one separately. As an alternative to wireless operation, the system can function in wired mode, and this kit includes the F1 and F2 cables for connecting both the receiver and timer module to the camera. The module features single, continuous, and bulb exposure modes, allowing you to choose from a huge range of exposure times with the continuous and bulb settings. Its interval timer is fully programmable and offers two timing sequences, as well as selectable delay times. Additionally, Digital Channel Matching (DCM) ensures quick and easy pairing of other receivers and triggers if you choose to expand your setup. The Captur works on the 2.4 GHz frequency for reduced radio interference and an impressive operating range of up to 328'. It offers simple controls and a large, easy-to-read LCD screen for hassle-free operation. Pressing the shutter release button halfway will activate autofocus, while a full push will trigger the shutter to capture an image. Box Dimensions (LxWxH) 10.709 x 4.724 x 2.205"
Captur Timer Kit for Fujifilm DSLR Cameras is rated 3.3 out of 5 by 3. Rated 4 out of 5 by Earl from Works with Fuji X-T2 and GFX-50S Works as advertised.? The instructions are a little confusing - something is lost in the translation from German.? Note that it does not support flash sync on the Fuji cameras.? It should work with any Fuji camera that uses the Fuji? RR-90 wired remote release. Rated 5 out of 5 by Shelley from Works with GFX 50S Very good product, works well. Rated 1 out of 5 by Todd from DOES NOT WORK WITH FUJI S3 PRO DON'T WASTE YOUR TIME, DOES NOT WORK WITH FUJI S3 - LISTING SAYS IT'S COMPATIBLE, IT'S NOT. Does this work with Mirrorless cameras, the X-T2 specifically? Does Captur Timer for Fujifilm Does Hahnel Captur Timer for Fujifilm DSLR cameras work with Fujifilm GFX 50S camera? Asked by: M. Dudley C.